a game which ensured the Super Eagles missing out of the 2015 AFCON in Equatorial Guinea with the South Africans progressing alongside Congo from the group. Bafana Bafana striker, Tokelo Rantie scored a brace on that night before Sone Aluko got his own double to deny the visitors their first competitive win against the host. Nigeria likewise misses out on the 2017 AFCON in Gabon with Chad pulling out of the qualifiers which meant only one team could qualify out of the group. Egypt picked up the sole ticket of the group having drawn with the Super Eagles in Kaduna and then a 1-0 home win in Egypt which ensures the Super Eagles missing out on two consecutive Afcon finals. 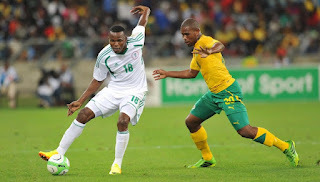 There were lots of experienced players in the team, many veterans including 2013 AFCON top scorer Emenike, Ighalo, Ideye, Enyeama, but the Super Eagles had lost their fear factor, with countries like Sudan and Congo inspired by Biofuma indeed defeated Nigeria, with the latter achieving the feat in Kaduna.